I mentioned yesterday that this is a busy weekend in MLS. Eight games tomorrow and one on Sunday make for a lot of soccer to watch. No doubt the talk of the weekend is going to center around Portland and Seattle’s match tomorrow night. A lot of folks talk about the importance of this match for the league and this should show off exactly what everyone has been saying about this rivalry since the day Portland was announced as an expansion team. Believe it or not the Cascadia Cup is not the only game this weekend. There are plenty of other solid matchups to look at. Below are my predictions for this weekend. Feel free to leave your own below in the comments section. Chicago Fire at Toronto FC: After seeing Toronto on Wednesday, I can honestly say they aren’t a half-bad team. They are just missing some elements that will make them a contender right now. Their midfield is getting strong and if they can get some attacking pieces, they’ll be set. Saying that for this game though shouldn’t be too much of an issue as the Fire lack the quality in the midfield. They have the talent with guys like Marco Pappa but until they get someone to step up and be a leader on that squad they’ll continue to struggle here. I like the Reds to get three points here, to make up for not getting at least a point in Frisco. Vancouver Whitecaps at New England Revolution: The trend at the moment is teams playing on opposite coasts and not winning. I’d expect that to continue has Vancouver visits New England for the first time. The Revs need a game that they can bounce back in and begin looking like the club we saw a couple weeks ago when Benny Feilhaber arrived on the scene. But the Revs will be without a couple key parts in the back which make this one all the more difficult to predict. Smells like a draw to me right now but the money says New England. Colorado Rapids at D.C. United: Another fun one to figure out as the Rapids are battling injuries while United is battling consistency here. Apparently Bob Bradley will be in RFK tomorrow assess Charlie Davies, so I’d imagine he’ll want to impress the ol’ ball coach. Colorado should have Conor Casey back for this one to even things out a bit. The battle falls to the midfield and this one feels like a split. Draw seems likely. Philadelphia Union at FC Dallas: I feel this one could easily go 1-0 either way here. We know that seems to be the case with all Union games these days. They don’t give up much and they don’t score much. Going on the road with short rest against a tough Dallas defense won’t make matters any easier. Dallas isn’t any better at the moment on offense so the low scoring thought will likely ring true. Normally I’d easily go with a home team going against a team on short rest but just like the other picks this one smells badly like a low scoring draw. Houston Dynamo at Real Salt Lake: Unlike Seattle and Dallas, RSL should be fairly fine without Javier Morales. In fact, they’ve had to deal with him being out before and did alright without him. That being said it won’t be easy for the long-haul but this club should be fine here for this one against a struggling Dynamo team. Houston is tough to gage here as they went unbeaten in six and then last week dropped two straight ugly games. Plus, RSL doesn’t lose many games at Rio Tinto…I don’t expect them to this weekend either. Sporting Kansas City at LA Galaxy: This marks the seventh road game for Sporting and they at least come off some rest here. LA on the other hand just got back from a midweek tilt in Philadelphia, where they drew the Union 1-1. I don’t imagine KC staying with LA’s offense here given the issues they’ve had on defense so far this season. Plus, now that Landon Donovan is scoring again here, he doesn’t look like he’ll stop anytime soon. That smells trouble for the visitors. Columbus Crew at San Jose Earthquakes: In one way I want to lean San Jose with this pick given how they played for 89 minutes in Vancouver on Wednesday but giving up that late goal had to hurt a bit. Columbus comes into this game with one of the league’s best defenses and with the Quakes struggling to score at the moment I can’t imagine they’ll give up more than a goal in this one. Columbus has to find a way to keep the pressure up on the Quakes defense. If they do that they’ll get three points, if not this one will end level. 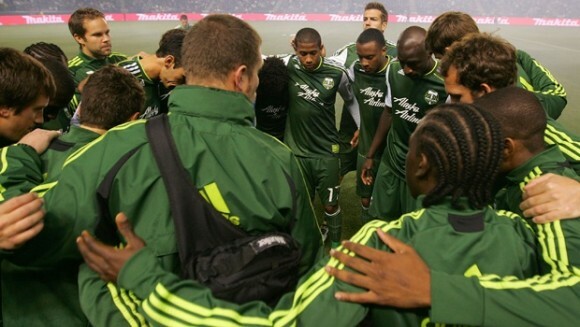 Portland Timbers at Seattle Sounders FC: This is the big one of the weekend. Can Portland pick up points away from home? I doubt it, especially against their biggest rivals. Portland has to make the most of their best weapon, set pieces. If they can do that they’ll get points out of this game but I’d imagine Sigi Schmid will do enough work on that this week to make sure it doesn’t happen. Gotta say, this one will be fun to see. Chivas USA at New York Red Bulls: Remember that little note about teams from one coast not winning on the other coast here? Yeah, Chivas travelling east to New York doesn’t sound like a good thing for Red-and-White fans here. Plus, you know New York is pretty dang good here. I’d imagine the losses of Andrew Boyens and Marco Mondaini will also be a factor for Chivas too. Portland will walk away with 3 points while you EADIAF.